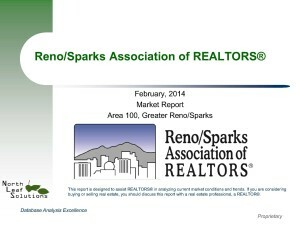 Thank to the Reno/Sparks Association of Realtors for the updates home sale statistics for February 2014. You can view the full report by clicking the picture to the right and below is a brief explanation of the main data. Median sales price jumped up to $235,000. A 6.8% jump from January 2014 and up 23.6% from Feb. 2013. This is the highest amount since the bubble. The biggest jump came from regular sales at 8.1%, REO/bank owned fell 2.1%, and short sales went up 1.7%. Remember, normal market appreciation is 3-5% per year. Units sold was up 7.1% from last month which is typical because we’re leaving the slower cold month market. There were 548 new listings. 79% were regular sales, REO/bank owned 6%, short sales 13%, 1% were other. Good news for all as sellers are able to sell without short sale”ing” and buyers can become homeowners within 30-40 days of an accepted offer. Average days on market for regular sales was 95 days, REO/bank owned at 89 days, and short sales at 233 days. Yes, short sales still take forever. Month’s supply of inventory dropped to 4.5% which puts back into more of a seller’s market. Anything above $750,000 is still a buyer’s market. Overall, I’m kind of surprised by the median sale price jump. Though it’s indicative of the market moving into buying season. Posted in For Buyers, For Sellers, Market Update and tagged homes for sale in reno nv, information on home buying in reno nv, reno foreclosure stats, reno home value stats, reno home values up, reno real estate agent, reno realtor agent.